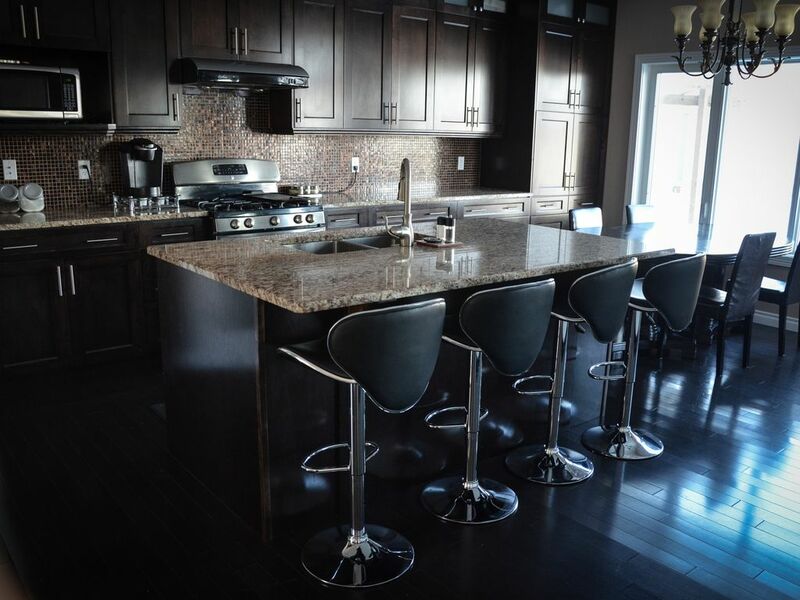 Beautifully built luxury home in South Edmonton community of Summerside. Main Floor Rental - 5 bedrooms and 4 full bathrooms, Sleeps up to 10. Basement Suite may be added on as an option and adds on 1 bedroom and a sofabed, Sleeps up to 4. Main Floor Rental: 4 large bedrooms upstairs and 1 bedroom on the main level, large gorgeous open-concept kitchen, formal dining room, living room and den are great for entertaining guests or relaxing with family and friends. Basement Suite Rental: 1 bedroom and a sofabed may be rented as well to accommodate 4 more guests. Message Owner to add it. House backs onto lake, with beautiful view and walking paths. Great location, close to all amenities and great shopping. Perfect base location for exploring all parts of Edmonton. Air conditioned for those hot summer days, includes wi-fi, and Telus Optic TV, 2 big screen TVs, Netflix & BluRay player. Basement suite - Sleeps 4 (additional $110/night for the basement suite). See details below. Fully furnished and Includes linens, towels, and a full kitchen. This rental includes use of the backyard, with playground, and huge wrap-around deck with bbq and comfortable deck furniture. This house also has a basement suite with a separate entrance, which is normally empty. It sleeps 4 and can be added onto the rental of the main floor for an additional $110/night. The basement suite is also furnished and includes linens, towels, a full kitchen, living room, bathroom, 1 bedroom with queen bed and sofabed in the living room. We are a family of 7 who love to travel and experience the world. We enjoy sports and the outdoors. Large and modern. Beautiful lakeview. Great for kids, groups and families. New home with modern furnishings. Great for family. Close to all amenities. Great shopping within 10 minutes. Excellent access to the Anthony Henday. Nice views, quiet neighbourhood. Large deck with deck furniture for 6. Overlooks lake. 2 steps up to the house. There is a bedroom and full bathroom on the main level. A great property that suited our needs well. The house was clean and comfortable. More than enough space for everyone. The house was fantastic. Large comfortable bedrooms and ensuites, very clean and well maintained. Very nice to have a garage on cold days. Well appointed kitchen with lots of space for large families. Would highly recommend this property. This was a perfect house for our family of 12 for a short vacation in Edmonton. We enjoyed the Pampa Brazilian steakhouse too which was just a few minutes away! Thanks Angela! We had a group of 8 people staying and the house was perfect for us. There were enough rooms, everything was clean and the location was great. Would definitely stay again. The house was perfect for our get together. Comfortable and very nicely furnished. Angela was super accommodating. Note that VRBO may quote in US$. To convert to CAD$, Go to the Rates tab, and change currency to CAD$. Signed Rental Agreement required. Cancellations are subject to a $100 admin fee. Rental of the basement suite can be added for an additional $110/night and sleeps 4 extra people.